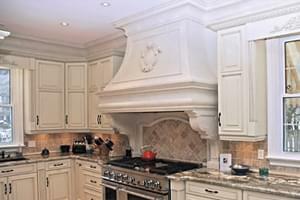 Custom stone range hoods can be the focal point of your custom designed kitchen with their breathtaking beauty and durability. 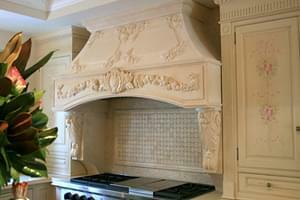 They can be hand carved in many sizes including 36″, 48″, and 60″ or custom made to best fit your kitchen. These beautiful natural stone range hoods can be hand carved out of the highest quality Italian or French limestone in either an intricate design or a simple design with clean lines. The Italian marble allows for a more smooth and elegant look whereas the French limestone is a more rustic aesthetic. They can be custom design to be double sided for an even more extravegent look or very simple for a more modern kitchen. 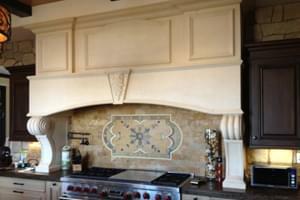 These stone hoods can be custom made to include corbels that are urged and bodacious or very minimal only meant for extra support. 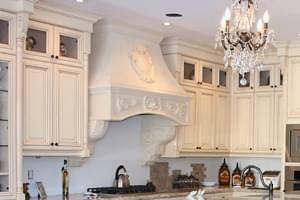 Marvelous Marble Design is the leading designer in custom made stone range hoods that will be the focal point of your custom design kitchen in your mansion.